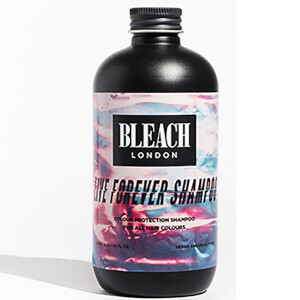 Indulge your inner colour chameleon with BLEACH LONDON’s Super Cool Colour; a non-permanent hair colour cream that fades out in several washes so you can dive in head-first and rock those vibrant locks you’ve always wanted, without the commitment. Arriving in a kaleidoscopic spectrum of mesmerising hues, the cream mask transforms (fair or pre-lightened) hair in just 30 minutes, into a show-stopping mane of brilliant colour from fire engine red and turquoise to soft lavender and dusty rose – whatever suits your mood. Wearing gloves, apply generously to shampooed, towel dried hair. Massage or comb through mid-lengths and ends before leaving to develop for 30 minutes. Rinse out and style as desired. Aqua (Water), Cetearyl Alcohol, Ceteareth-20, Citric Acid, Behentrimonium Chloride, Phenoxyethanol, Isopropyl Alcohol, Dipropylene Glycol, Parfum (Fragrance), Acid Red 92, Benzyl Salicylate, Coumarin, Linalool.